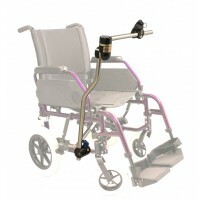 Our most popular mount is similar to the Rigid Mount when in use but the elbow joint comprises a folding mechanism which allows the horizontal tube to be lifted and folded at the side of the chair. This means that the mount can stay on the chair but out of the way when not in use, and when removed from the chair it is a compact unit to carry and transport. The Side Folding Mount is available in Standard and Locking versions. DFM2: Compact and portable, designed to fold by the side of the chair when not in use and for eas..
DTSFM: Featuring the Daessy locking clamp assembly, allowing the mount to be ‘locked’..
B/DFM2: This new version of the Standard Series Side Folding Mount features black tube, giving th..
B/DTSFM: This new version of the Standard Series Locking Side Folding Mount features black tube, ..